We finally got our nature table back up, and it’s all due to Katie Grace. This was totally her project. 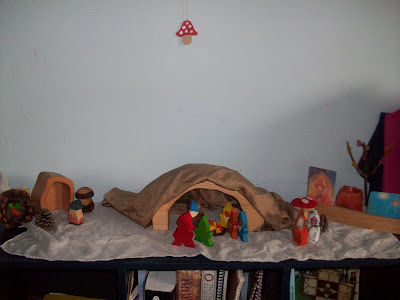 Martinmas pictures and a lantern made last year. Behind that, an autumn tree and beeswax owl Nicholas made. 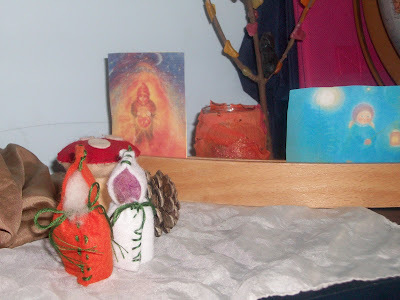 In front we have gnomes sewn by Katie Grace and Nicholas, a mushroom made by me, and a pinecone from our yard. 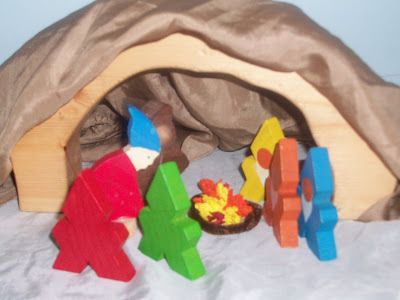 The gnome cave and bonfire, set up by Katie Grace. 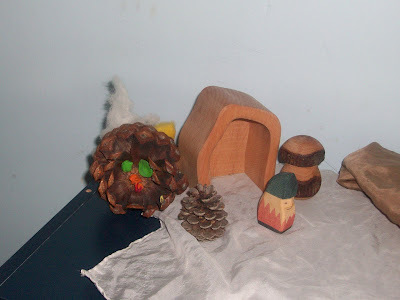 A lonely gnome in a solitary cave, hanging out with a pinecone turkey, sporting wool fleece feathers and clay facial features. wow, I just love your nature table!!! Beautiful! It was all Katie Grace. I've been slacking lately, LOL!